The Set Strikes Back – Can I get a copy of that? You might wonder what happens to the set after a production. Simple. We blow it up. As exhilarating as rocket propelled demolition might be, I would still have a mess to clean up and an email from our head of maintenance asking why the paint of the stage was damaged. Not to mention the school frowns on explosives. In reality set strike is not exciting. It’s not glamorous. Its miserable, heavy work. Unfortunately there’s no time to be sentimental in theater. 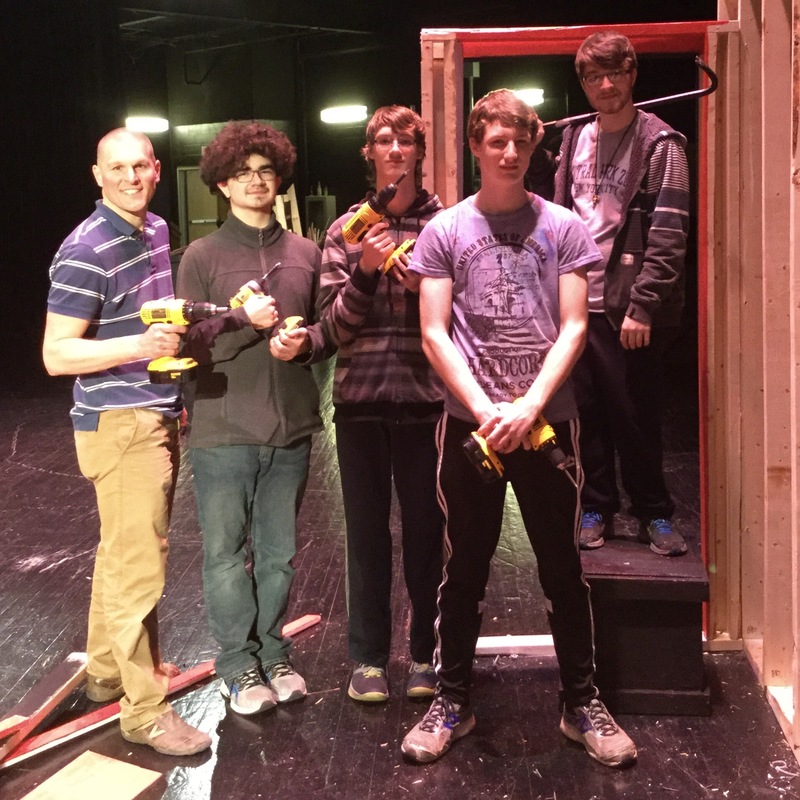 Both tech crew and pit band began the tear down process as soon as the auditorium was clear after Saturday’s final performance. That’s pretty late for a guy who’s in bed most nights by 9 pm. Never one to stand in the way of progress I agreed to come help. The tech crew wanted to get an early–or is it a late–start on striking the set because L-S Idol an annual K-12 talent show was the following weekend and the stage needed to be clear for their upcoming rehearsal and event. When it came time to leave the house Saturday night for set strike, Benson was determined to come. Against my better judgement, I let him. I thought he might be a good reason to leave when I had had enough. Much to my surprise though he was a great helper. Benson and I with three other students worked until almost midnight. They removed most of the lights and electrical from inside the set and around the stage while I demoed most of the second story. I felt hungover most of the day Sunday being out that late.. Attendance at Monday’s set strike is mandatory for cast and crew. But showing up isn’t quiet the same as actually helping. In my opinion, helping without being asked and staying until the job is done speaks volumes about a person’s character. Despite taking several hundred man hours to construct-I personally invested 80 hours-the entire set is typically broken down and put into storage for next year’s shows in just a few days. By 4:30 pm on Monday we had disassembled the entire structure. There’s still piles of modular walls and flights of stairs to put into storage. Not to mention trash to put into the dumpster. But a bulk of the work is done. I hope to have a majority of everything else put away by the end of the week. What’s left of the set at the end of the day on Monday. My core team of set builders and dismantlers. I’d go into Mordor with these guys anytime. If you have a problem, if no one else can help, and if you can find them…maybe you can hire the Set Construction Team. As for the items we can’t reuse and are too large for the school’s dumpster, they make the lonesome journey to my house for a Viking send off.